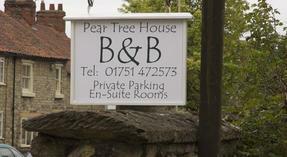 Pear Tree House Bed and Breakfast accommodation in Pickering, UK. Sarah & Chris Jones very much look forward to welcoming you to Pear Tree House Bed & Breakfast, a beautifully appointed property providing affordable comfort. Pear Tree House is a small family run Bed and Breakfast, and we all look forward to welcoming you into our home. We are a 4 star rated B&B with three lovely well appointed and recently refurbished rooms, that are all light and spacious to enable you to unwind in a happy and relaxed atmosphere. Each room has T.V, free WiFi, Tea and Coffee making facilities, hairdryer and complimentary toiletries. Two rooms have ensuite shower/bathrooms and the third has its own private shower room just outside the door. We are family friendly and welcome well behaved dogs with their owners! Guests have access to a lovely snug Sitting Room, full of books, games, and magazines to relax in the evening. Breakfast is a hearty affair, and nobody leaves hungry! we try to source our fresh produce as locally as we can. All diets can be catered for. We are easy walking distance into town. Pickering is the “Gateway to the North Yorkshire Moors National Park and the ideal place to stay to explore the wonderful local area .